"Honk if you know Darian," read one yard sign, sponsored by Carnival Cruise. Shaquille O'Neal wanted to know: Where was 15-year-old Darian? 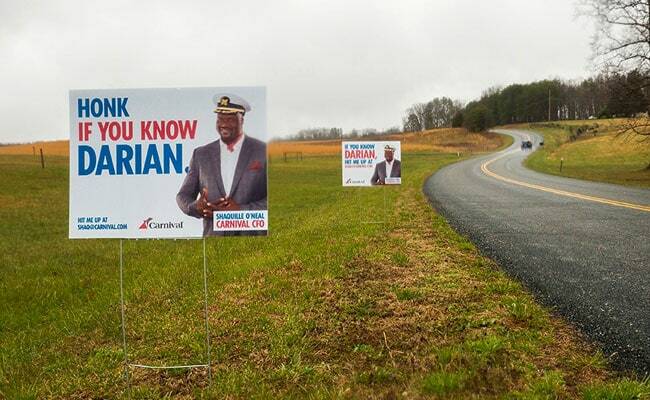 "Honk if you know Darian," read one yard sign, sponsored by Carnival Cruise, in Darian Lipscomb's hometown of Prospect, Virginia. "Hey Darian, It's Shaq. I've got an offer for you," teased a poster tacked up on a brick wall. "Hey Prospect, does anyone know Darian?" asked a billboard hitched to the back of a truck, weaving its way through town. Carnival found Lipscomb in the end. But what one of the world's largest cruise lines was really after was his Snapchat handle: @CarnivalCruise. On Monday, Carnival Cruise filled Prospect with its Shaq-themed posters and signs. The next evening, a truck hauling a billboard pulled up in Lipscomb's driveway. Relatives snapped photos as Lipscomb's jaw dropped and the big reveal sunk in: an all-expenses paid cruise on the line's newest ship, the Carnival Horizon, for a European vacation valued at $5,000, plus flights and hotels for Lipscomb and his family. For Lipscomb, the grand sweepstakes came at a price. He'd have to forfeit his Snapchat name. "We thought this would be a fun way to claim our handle and reward a 'superfan' at the same time," said Robyn Fink, Carnival Cruise Line's director of consumer public relations. Snapchat's terms of service says that users agree to not to buy, sell or rent access to a Snapchat account or username without Snapchat's written permission. A representative from Snap said Carnival and Lipscomb had permission for the exchange. Lipscomb could not be reached by The Washington Post, but he told the Richmond Times-Dispatch that while on a cruise at age 9, he created the @CarnivalCruise Snapchat handle to share snapshots of his tubing and ziplining adventures. Lipscomb's handle had eluded Carnival Cruise ever since. So Carnival came to Lipscomb. A video of the surprise provided by Carnival showed Lipscomb, sporting a gray checkered button up, walking out his front door to see a billboard-size image of the smiling Shaq - Carnival's "Chief Fun Officer" - in his driveway. With a wide smile and deep dimples, the teenager said he wasn't expecting Carnival's grand gesture. "I really like Carnival Cruise," Lipscomb said in the video. "I just like their food, and, like, there's a lot to do on the ship and, like, at nighttime, you can go and get ice cream." Lipscomb and his family will set off for Barcelona on March 31 for his fifth Carnival Cruise. As of Thursday afternoon, the @CarnivalCruise Snapchat handle was still tied to a user named "Darian," followed by a few emojis. Lipscomb told the Richmond Times-Dispatch that he doesn't know what his new handle will be called. He's considering another company name.